At Maplewood Dental Associates, we strive to provide high-quality cosmetic, restorative, and general dental care in a relaxed, friendly office environment. Our doctors and highly trained team of dental specialists work hard to help all of our patients achieve healthy, strong teeth, and we take a holistic approach to helping our patients maintain optimal oral health. Generally, we seek to avoid tooth extraction and replacement - but when it is necessary, dental implants offer an unparalleled solution. Tooth replacements have come a long way since the days of wooden teeth, and dental implants represent the latest and most effective evolution of the procedure. They're small, simple, and remarkably long-lasting, providing a durable and realistic-looking replacement tooth that maintains its function and appearance for years to come. The secret to their success is their unique property of osseointegration: the titanium that they're made of actually fuses with surrounding bone, providing a remarkably stable base for a new tooth. 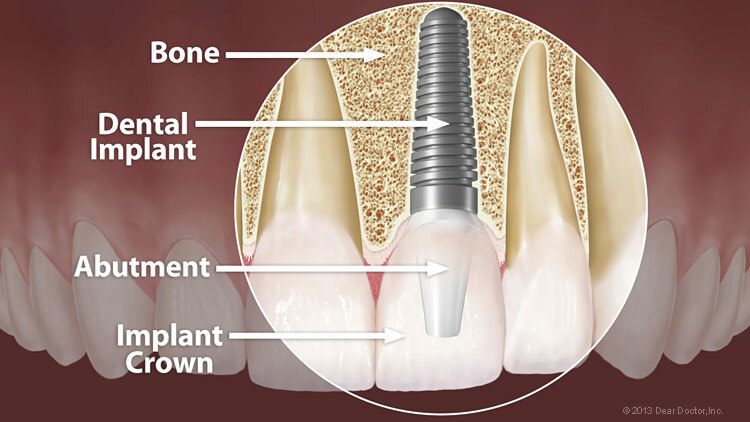 Generally, dental implants are small, screw-shaped titanium posts that slide into the area of the jaw normally occupied by the root of the tooth. The surgical procedure required to place them is remarkably minor, usually requiring only local anesthesia and lasting less than an hour. A short healing period follows the placement, and when the implant is ready, it's topped with a lifelike crown that's custom-made to match the color of your surrounding teeth. 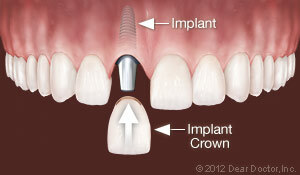 Implants have an astounding success rate of 95% - higher than any other replacement option available. 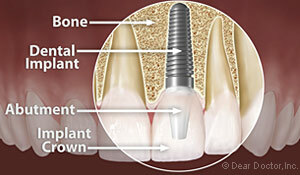 Replace One Tooth — To replace a single tooth, we'll insert one implant into the bone where the root of the old tooth was. After placing the implant and letting it heal, we'll affix a crown that simulates the shape, look, and function of a normal tooth. This option has the highest success rate, so even if it costs slightly more than other options, it can often provide the most cost-effective solution in the long run. Replace Multiple Teeth — If you're missing more than one tooth, implants can still provide a great solution - and you don't necessarily need one implant for every tooth. We can use bridges to replace multiple teeth with only two implants, providing a stable foundation and also allowing you to avoid using other teeth as bridge supports, which can weaken them. 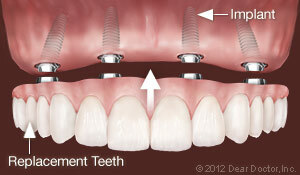 Replace All Teeth Permanently — Implants can also provide a permanent solution for an entire dental arch. The entire arch can often be supported by as few as 4 implants, and even in cases where jawbone has deteriorated; we may only need to use 5 or 6 implants to support 10-12 teeth. These replacements don't ever have to be removed, won't slip or slide around, and will protect your jawbone for a lifetime. 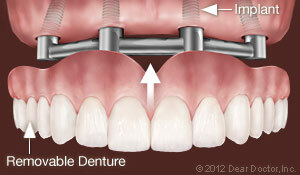 Support Removable Dentures — We can even use implants to make removable dentures more comfortable, healthy, and effective. Traditionally, dentures rest straight on the gums. Not only can this cause them to slip and shift position, but it also puts pressure on the jaw bone, which can accelerate bone loss and shrink the jaw. Implants can transfer the pressure from the dentures off the bone surface and onto the bone structure, which prevents bone loss and keeps the dentures from slipping around while you eat and speak. Implants are remarkably strong, but there are two things that can cause them to detach from the bone or fail: poor oral hygiene or excessive biting force. 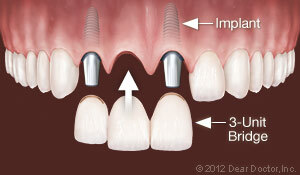 When combined with dental implants, poor oral hygiene can cause a dangerous bacterial infection called peri-implantitis. You can prevent this condition through daily brushing and flossing, avoiding sugary and acidic foods, and receiving professional cleanings on a regular basis. Excessive biting forces can cause a problem if you habitually grind or clench your teeth or if you don't have enough implants to support your natural bite force. We'll work with you to determine the number of implants you need to support your bite, and if you grind or clench your teeth, we'll fit you with a nightguard to help protect your implants from damage. With consistent, conscientious care, your implants will provide a durable and realistic tooth replacement solution for the rest of your life. Are you ready to protect your jaw and take back your smile with realistic tooth replacements? We're here to help. Feel free to call us at 651-770-3831, reach out to us at our contact page, or use our easy online form to schedule an appointment at our Maplewood, MN office. We can't wait to hear from you, and we look forward to helping you achieve a full set of beautiful, healthy, and strong teeth.